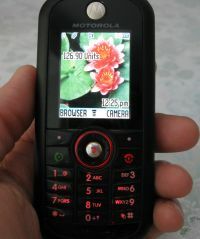 I owned a Tracfone Motorola C261 phone for about a year and half until I lost it (the phone that is). So here's a pretty in-depth review of the first camera phone available for Tracfone. The C261 is no longer offered. The open-face style LG 500g and Samsung T404g slider phone are the current options that seem closest to its feel. I liked the phone and wrote the in-depth review below. I'll go over the features, show you what kind of pictures you can take with the phone, what you may like and dislike, and even a couple of useful tips such as how to customize the menu. I bought mine online and the shiny black phone arrived at my doorstep a couple of days later via UPS (you have to sign for it). The color display does turn off fairly quickly by default when you're not using it in order to save battery life. You can adjust this in the settings. This is cool. There is a big (for a cell phone) speaker in the back which really does provide enough volume to use as a speaker phone. Very useful if your hands are busy at the moment or if you're on hold and listening to Muzak (and grinding your teeth as the minutes tick by). The phone book has two kinds of contacts: number and email. This makes it easy when sending text or picture messages so you don't accidentally send to phone instead of email or vice versa. Forget this feature. Tracfone only allows you to visit their sites via the phone's web browser, and even getting that to work properly take some effort. If you really need web access on your phone, pick another service. The calculator is basic but easier to use than some other calculators on cell phones. You can add, subtract, multiply, divide and convert currency, and these basic operations are available from the ring-shaped button. The alarm clock is good as a backup when traveling. Okay, you probably won't be using this feature to see how long it takes you to do 10 laps, but it is kind-of-useful to keep track of how long you've spent on a task at work. The Notepad can be good for quick reminders on a trip. 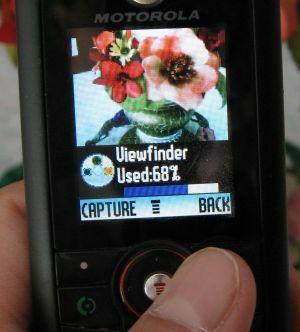 The Motorola C261 camera is quite basic, but you can still get the most out of it, just as with any other camera. I will also show how to email the pics to yourself of anyone else. The VGA quality camera is okay for emailing pics of for posting on your personal page, once you figure out how to extract the pictures from the camera. Taking and storing pictures is pretty straight-forward. Turn on your C261 camera phone. Click the top right button below where it says "Camera". The display will now show you the lens view and display the percentage of storage space already used. I can fit about 20 pictures before I run out of space. You can choose Store Only, and you're done with taking the picture. While taking picture you will see, in the lower portion of the screen, a circle that corresponds to the circular button on the keypad. Press the top and bottom of the circle to zoom in and out. Remember that digital zoom is not a real optical zoom, but it can come in handy sometimes. You can press the left and right sides of the ring to adjust the brightness. Most of the time you don't need to use this feature as the camera does pretty well in normal light. If there's a strong light from behind, such as when your subject is standing in front of a window, you can try adjusting the brightness higher. Usually it's easier to tell the person to move! Once you've stored your pictures, you'd like to share them, right? Well it's not clear how to do that. After leafing through the Tracfone Motorola C261 manual, I decided that I could send the pictures to my email account via an MMS message. To test this, create an email account in the phone for yourself. I call it "Me" and enter the email address for sending yourself these pictures. Go to the Messages section of your menu and press "Create" and select "MMS" as the type of message. You can enter some text if you wish and then choose "INSERT" and choose your picture. Insert more picture is you wish and then choose "Done". You can only "insert" one picture, but you can add more as attachments. Altogether, you may be able to squeeze in up to four pictures before the message becomes too large. Choose the email contact to send it to, and then you're really done. It takes a while to send the pictures, and it'll probably cost your at least 2 units of airtime. When you click send, a message pops up that one unit has been deducted. The phone continues to send the message. While sending, the Tracfone displays a pop-up message that a half-unit has been deducted and by the time the picture message has been sent you've used up about two units. So far, this amount seems to be the same whether you send one or four (the maximum I've manage to send at one time due to the space limit). Depending on the file size of the pictures, you may only be able to send one or two at a time. If you take a lot of pictures, you should send as many as you can in one message to cut down your airtime costs. Depending on whose network Tracfone uses in your area, this address may vary. Check your spam filter if you can't find it. A small nitpick I've been puzzled by the Motorola C261 Lens in terms of its focal length and depth of field ever since I purchased one late last year. I've been somewhat pleased with the photos I've taken with it, but I always felt that even for a VGA-resolution camera it is not delivering all it can deliver. The pictures, seemed sharp in unexpected places. 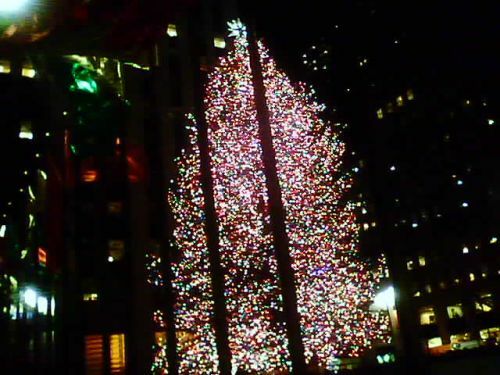 Here are some example of photos I've taken using the Motorola C261 lens here for your viewing pleasure. The camera was in focus at a distance of a couple of inches! 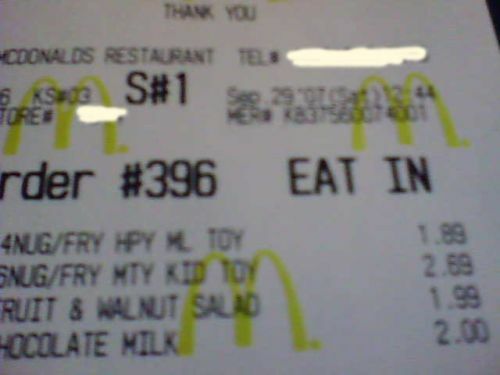 To test that, I recently pointed it at a receipt from McDonald's (the kids made me take them there, honest) while waiting for the children to finish eating. The numbers on the receipt are legible! Well, this is not exactly ideal. The point of sharpest focus should be the distance for a typical group snapshot. Still overall I'm happy with the pics taken with my Tracfone Motorola C261. Here's another picture taken on a mini-vacation. 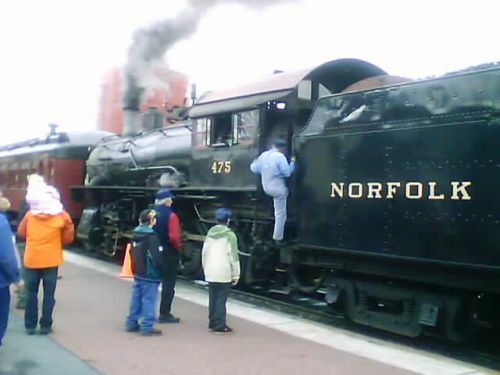 We rode a Strasbourg Railroad Amish train above which was pulled by an old Steam engine. It was a short one hour ride during which lunch was served in the dining car. Nice. While the Motorola C261 doesn't have a whole lot of fancy feature, it does have a pretty useful calculator that's perfect for those moments when you need to quickly check a couple of figures but don't have another calculator and don't want to do it by hand or plug it into a spreadsheet. Well you can shorten that slightly (by one click). This may not seem much, but if you use it a lot over the year, it adds up. Click on the round menu button in the center. Use the ring-button to move the selection to the "tools" section indicated indicated by the screwdriver and wrench icon and select it. And you're done! Unfortunately, there seems to be no way to move the Office Tools option ahead of Tracfone's "$" option. Otherwise you could get to the calculator in 3 click. As it it, you can now get to your calculator in four clicks. Nowadays you have a wider range of choices for camera phones from Tracfone, but this is still a pretty good phone. The camera resolution is still as good as with other models available and a few items like the loud speaker phone and easy-to-use calculator are pluses, and the prices are comparable. This and most other Tracfones qualify for: Free Shipping on orders $19.99+!